Catherynne, Catherynne, Catherynne. Will you ever fail? If I had to sum up this book in one line, it would be: This book is everything I have ever wanted from Sci-Fi and more. (Or a ‘a decopunk pulp SF alt-history space opera mystery’ as is more accurate, and brilliant.) Let’s face it, space whales. It’s so very me. 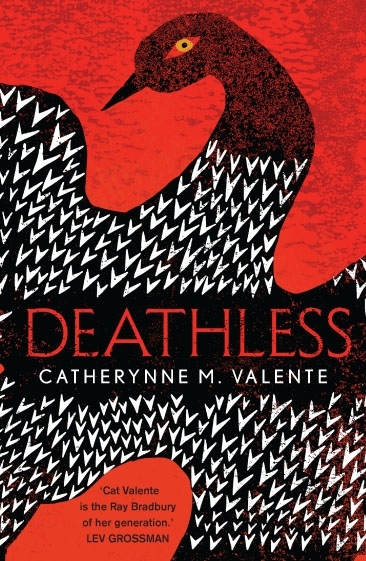 I am a self-confessed Catherynne M. Valente fangirl, I claw and clasp at everything she writes and can’t get enough (around seven months ago, I got words from Deathless tattooed onto my right bicep, and intend to get another from the same novel on the back of my left calf). But I am not ashamed to say that, I wasn’t sure about this one – I’d never read a novel which uses so many different kinds of storytelling. However, there was no way I wasn’t going to read it. Boy, I’m glad I did. It is a beautiful, spiralling mystery, which seeps like paint. I loved piecing together each little snippet and clue, and I loved the descriptions of the creatures which still had their Earth names but were very much not the same as their earthly counterparts. As ever with a Valente work, the world building was complete and phenomenal, packed with little details that, while they do nothing to further the plot, solidify her version’s of planets and moons in a way that I never quite expect, even though I am used to seeing it in her work. Valente is as poetic as ever and uses the different formats excellently, I’ve very rarely found myself enjoying reading a script but at this point, I am sure that I would adore reading everything she writes. Including her shopping lists. But not in a creepily stalkerish way. In a ‘I bet even they are poetic’ way. Rein it in, Elou. Anyway! The different formats in the book makes for some interesting typesetting, I particularly love the icons at the beginning of each chapter denoting on which planet it takes place. The cover featured above is from the US, the book doesn’t come out in the UK until March but I adored the US cover desgn and had to own it (not to mention, I wanted to read it as soon as I possibly could, especially as I have to wait for the paperback editions of the Fairyland books to match my existing collection). Like I said, I claw for her writing. What began as a short story in a zine, which I am listening to as I type, turned into a beautiful journey through space, and time, ever chasing a phantom of a girl who will always be a mystery that I would love to solve. Thank you for another beautiful novel. I have been sat on this review for a while. I wasn’t quite sure how to put how much I loved this book into words. I think the best way is to tell you that after I finished reading it, I bought it for my best friend. I not only wanted her to read it, I wanted her to own it. And now she does. Catherynne M. Valente has steadily grown to be my favourite author alongside Neil Gaiman and it is in a big way because of this book (as well as her Fairyland series and Palimpsest). Valente is a poet, her work is always very lyrical and inspiring. It is as much her use of language as the stories she tells that makes me love her work so much. It’s so rich and fulfilling, it’s very hard not to feel satisfied while reading her work. Deathless tells the tale of Marya Morevna, a figure from Russian folklore, and Koschei the Deathless. I love folklore and it is clear that Valente does too, she weaves it together in a way which seems completely natural. Without prior knowledge of Russian mythology, it might take some Googling in some places where Russian terms aren’t explained but it is well worth it. Valente employs repetition, as you might find in old fairy tales, to great effect. My favourite parts of the novel were those which were familiar. It really added to the magic of the novel. Again, she is very poetic and it’s incredibly satisfying. The characters were compelling and while I didn’t always like them, I always cared about them. It’s hard to choose a favourite but I did particularly enjoy the domovoye (which, as I do not have the book on me, I may have spelt wrong). It has quite a large cast but that is not to the book’s detriment, in fact, it’s something I really enjoyed about it. I liked getting to know all of the different characters and creatures even if they did hurt my heart. This book tugged at my heart and is still tugging even though it’s been a while since I finished reading it. I would definitely recommend buying it. It currently lives beside my bed and I don’t see it moving any time soon.